Losing a parent, a mother, is a strange thing and not something that I’m all that used to yet. Sometimes my mom is still around – at least it seems that way for a moment, and then I’m jostled back to the present where my mom isn’t just a phone call away. Last night I washed the inside of my fridge and as I was wiping down all that white plastic, memories of doing the same chore in my parent’s house came flooding back. My mom would be on one side of the kitchen either prepping for dinner or washing dishes at the sink and I’d be hunkered down at the fridge with a bowl of hot water, a splash of white vinegar, and a cloth. We’d chit chat about our day or laugh about something we’d seen on tv or maybe I would be asking her about her own childhood summers at her family cabin at Lac-aux-Sables in the Quebec Laurentides. But it makes sense that cleaning would bring to the forefront memories of my mom – she kept a clean house and was very proud. My mom also loved good food. While as a family, we rarely went out to eat at restaurants, my mom and I would often go for lunch on a Saturday afternoon or I’d meet up with her for a quick lunch during the week. My mom liked hippy vegetarian places with names like “From Soup to Nuts” and we’d eat a hearty soup chock full of beans or a spinach and strawberry salad from a picnic table out front. She loved trying out new recipes and was always clipping ideas from newspapers and magazines. Flipping through her cookbooks and recipe folder, I would inevitably find hand-scribbled notes like “Val doesn’t like this”, “Four Stars!” or “Delicieux!”. I introduced her to quinoa and while I wasn’t an ardent fan, she loved it and would tell me via telephone about the salad she had just made with it. She also made a point in telling me that papa – Val – didn’t like it. When I discovered millet, I was instantly smitten. Along with millet, this salad is full of lentils, crisp vegetables and beets…roasted and sweetened, staining everything in their path. I’m certain my mom would love this salad and if she was alive and well, I’d email her the recipe. Instead, I’ll post it here as it’s wonderful, hearty and makes a great dinner on a hot night or would be ideal to take to a picnic or bbq. C’est delicieux! 1. Prepare millet per package instructions, though I like to cook them in vegetable broth rather than water, just saying. When all the liquid is gone, set aside. Meanwhile, cook lentils over med-high heat in 2 cups of water, covered. Set aside. 2. In a large serving bowl, combine the warm lentils and millet with the red onion and red pepper. 3. Combine everything from the garlic to the salt & pepper in a small lidded jar, taste and adjust seasoning, if necessary. Pour dressing over salt and toss well. Eat salad warm or cold. Wow. Your beautiful words about your mom really touched my heart and brought tears to my eyes. Thank you so much for putting some much needed humanity and beauty in the world today. Your mom would be proud. I love a good dish like this that you can throw together at the last minute. Perfect for a BBQ or picnic! Your mom sounds like she was a delightful lady who liked to eat a good meal. Gosh, that’s one gorgeous salad. Considering how much I love the beet/balsamic pairing, I’m quite sure we’d love it. I’m also loving the memories of your mom that come along with — those are the moments from which comfort foods are created, and they form the essence of why I cook. This post made my heart clench up. I’m so glad, at least, that you can find happy memories (however bittersweet) of your mom in your kitchen, in the food you eat and the routines you go through and the cleaning up you do. Like Tracey said above, I’m sure she’d be proud of you. I loved this post about your mom and you! It’s poignant and refreshingly honest and I felt as if I were right there in the kitchen with you as you described the scene. Growing up, my family seldom, if ever ate out. My mom has never been a fan of restaurants and take-out. Yet, she always tried to make her own version of “take-out” at home by making us pizza, Chinese stir fry, pogo sticks, onion rings, samosas and pakoras! Like your mom, she’s always enjoyed cooking, trying out new recipes and writing notes on recipe clip-outs from magazines and newspapers. It’s so wonderful that you find snippets of memories of your Mom in everyday things like cleaning out the fridge, to remind you of good food. Millet has easily become one of my favourite grains! 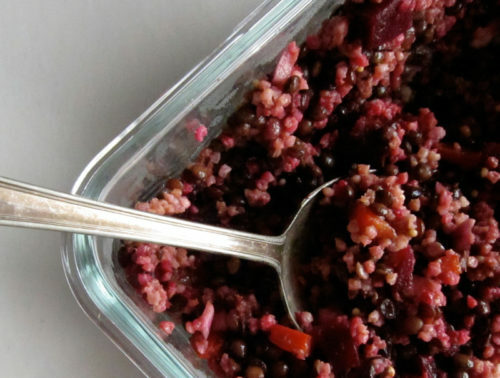 Lentils and millet and beets sounds like a healthy, hearty and delicious combination. I must return to this recipe soon when I have picked up some beets. Just touching, beautiful words. I must try this salad – I just love everything in it, but haven’t yet tried it all together. Beets…the power root…how could anyone or thing go wrong with this! It’s so nice the way food can bring people back, invoke some memories. This salad looks quite delicious. I’m just coming into liking beets, but I think the dressing sounds perfect for them. this is beautiful (and delicious) on many levels, jeanette. thank you for sharing both the recipe and your mother with all of us. I like those clear memories–washing the fridge while you two talked in the kitchen, going to hippie restaurants, chatting about quinoa. I cherish those kinds of moments. This was a lovely post, one I think she’d be proud to read. You honored her well. This recipe must be very heart healthy! We are always always *always* searching for healthier ways to eat and incorporate grains – so thank you. Oh, and I had never come across lentils du puy before – so I learned of a food product I did not know of before – I love learning about the healthy choices out there! so sweet. im sure your mom would find it so endearing, that the act of cleaning the fridge makes you think of her. the salad looks great, thanks for sharing. Perhaps you have read this? http://www.slate.com/id/2211257/entry/2211256/. I was reminded of it while reading what you wrote about your mother. I am very sorry for your loss. I find looking through my mother’s cookbooks is a way of bringing her back to me even if only for a moment or two; the comments in the margins describing her feelings on the recipe are an intimate, sweet little reminder and a way of keeping her close in my kitchen, as I cook. Thank you for reminding me of that. Beautiful post. Your mother sounds like she was an absolutely delightful woman! I lost a parent several years ago and I get so excited when memories flood back like that. It’s like they are there with you in the kitchen! Thanks for sharing this memory and this recipe. I’ve never cooked with millet, but I should! Really powerful post. I am always amazed by how most of us link food with family. 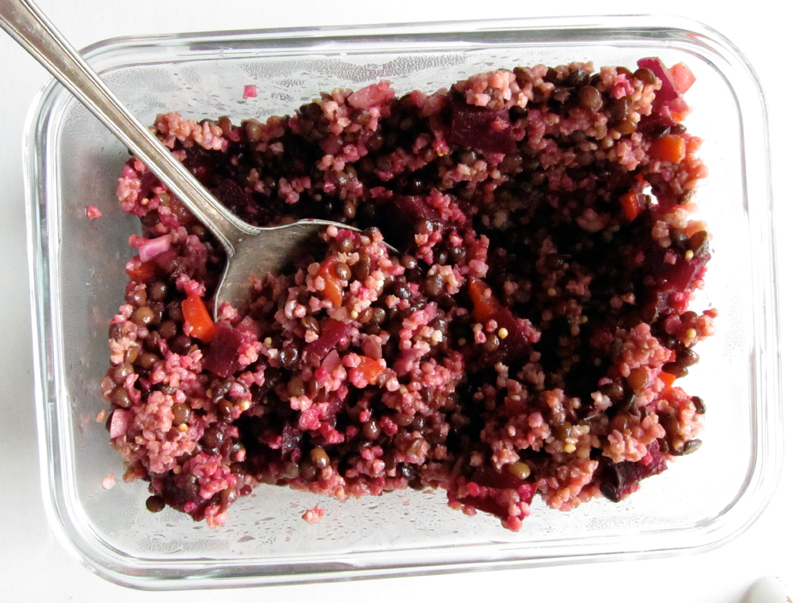 I can’t wait to try this salad…millet is something I haven’t experimented much with before. I need to work with grains more, in general. Thanks for the inspiration! What a sweet post — your mom must have been a very special person. I’m so sorry she’s gone — but it sounds like she’s really still with you in so many ways. How lucky she was to have you! And that is one delicious-looking salad! What a lovely tribute to your mom. I know things were difficult for a long time before she passed so it is lovely that you are able to remember such sweet moments with her. 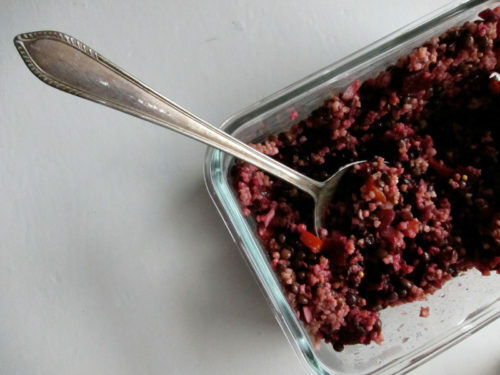 I have used millet only very rarely and I need to give it more of a chance with recipes like this one. Happy Canada Day to you! Indeed, perfect bbq food, Jacqui! Lo, it’s funny how memories seem to pop out of nowhere. Thanks Maddie. There are many happy memories & I like how they can just pop out without warning or preparation. Bijoux, sounds like your mom was a great cook! Millet is definitely one of my favorite grains & it works so well here. Thanks Kimberly, everything goes very well together. Joanne, beets go so nicely with balsamic. Enjoy! Thanks Shannalee, I hope I have! Margot, lentils du puy are so nice here because they stay firm. Hope you find some and try them out. Sara, it’s kind of funny that cleaning reminds me of her, but it’s so true! Thanks for the good read Margaret! Thank you. Monika, I’m glad I could remind you of your own special memories. Kristen, enjoy the millet, it’s a great grain! Funny how certain actions can remind us of your moms, PCWG! Thanks Dana. Yes, give millet a chance, it’s a favorite of mine. i just love your salad creations. in fact, the most recent salad i made i totally thought of you. LOL i know weird, but i thought i bet that ELS girl would totally dig this. Haha, too funny vanilla sugar!! Your salad looked pretty fantastic. I love those composed versions filled with good stuff! Your mom sounds like a wonderful person. 🙂 And this salad looks really good. Wonderful! I love all of the ingredients!